It’s a gorgeous afternoon; a generous breeze moving off the sea is keeping the heat in check. Rachel Graham of MarAlliance is on a Belizean beach deep in conversation with a local fisher—a sun-soaked man in his late 40s who’s describing his historical encounters with some unusual fish. His stories no longer come as a surprise to Rachel, who for thirteen years has searched these waters for a particular “unusual fish” called a sawfish. It’s been about 25 years since sawfish were seen regularly in the calm, warm waters throughout Central America. Decimated by the use of gill nets, which indiscriminately destroy huge volumes of marine species, sawfish are now so rare here they’re effectively extinct. The sawfish obtained its aptly-fitting name from what looks like a long, double-sided serrated saw protruding from its head. This defining feature, called a rostrum, can grow to be six feet long; the sawfish itself can be 20 feet—half the size of a city bus. It’s staggering to think we could have lost such a massive, dramatic looking animal, but Rachel doesn’t believe they’re completely gone. Since 2004, she has been conducting surveys with fishers and colleagues throughout Central America hoping to record sightings of sawfish. After years of no reports, things are starting to change. MarAlliance is now conducting research in more remote areas, farther from human activity, where sawfish are more likely to persist. The local fishers they work with in these areas have been talking about recent encounters with strange looking fish, possibly sawfish. 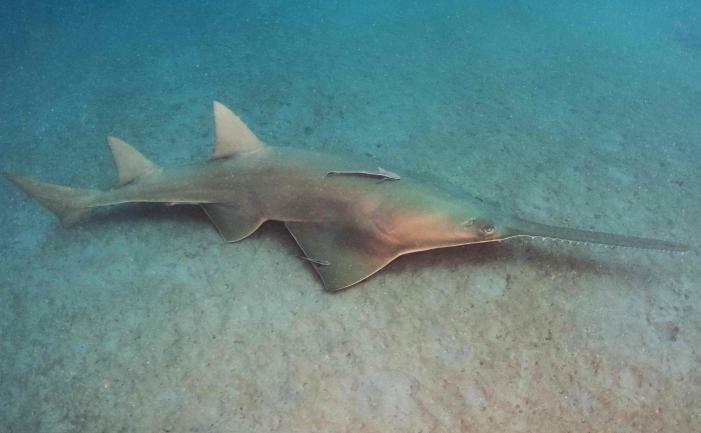 The conservationists continue to conduct surveys which they use to identify pockets of possible remnant sawfish populations, and they have a new tool to help find these elusive animals. Boating to these locations, they are employing a technique called eDNA analysis (environmental DNA) where-in they filter water samples to separate out any existing sawfish DNA. If the eDNA matches known sawfish DNA, it’s proof these extraordinary animals still exist in these waters. Pursuing sawfish not only benefits scientific inquiry—though there is a tremendous amount to learn about these species—it helps conservationists understand ecological shifts that occur with the loss of a key mid-level predator. Sawfish are both ecologically and culturally valuable; their return could boost the health of coastal and estuarine ecosystems. Beyond these tangible gains, the search for sawfish also provides hope that even if these species seem to have disappeared, we may find them again and bring their populations back from the edge of extinction.